A list of famous teen authors to inspire you. Video blog: Will losses mean writing is a hobby? If you show losses as a writer for 3 years in a row will the IRS classify you as a hobby writer? Video blog: Can a writer deduct travel expenses? Can a writer deduct travel expenses to an exotic place for research on a future book? Video blog: Are gifts a tax deduction? Here’s a short video clip of me, Carol Topp, CPA, giving a presentation to a writers group. I’m giving them a quiz on taxes for writers. An author who is planning a trip to England asks what he can deduct as business expenses. 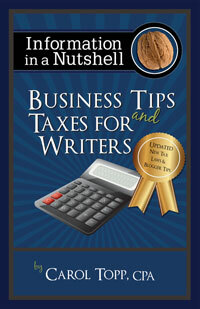 Carol Topp, CPA explains what an author can deduct on their taxes when they purchase their own books to resell. Video Blog: Can a writer deduct unpaid royalties?